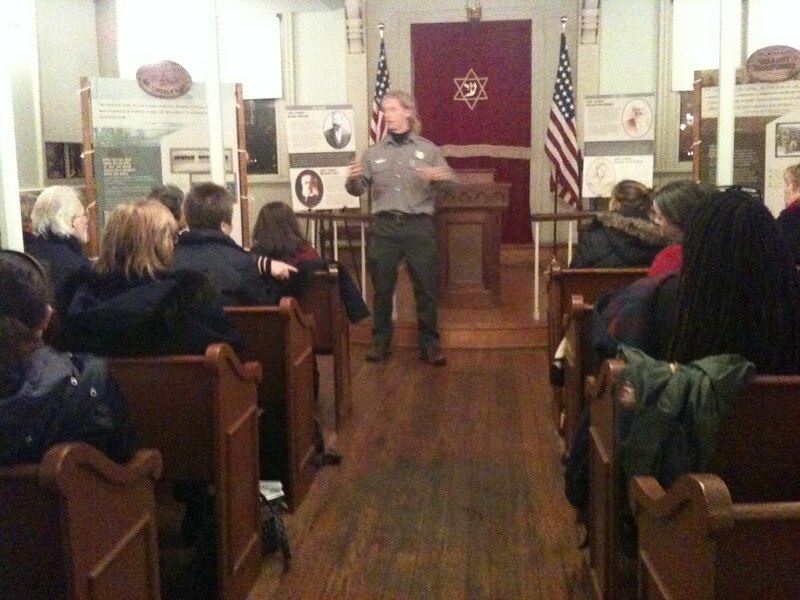 On January 13, more 30 educators converged on the Lillian & Albert Small Jewish Museum to learn about the plethora of places where their students can learn about the Civil War. Our guests mingled and talked with representatives from each site, then sat in the pews to hear what each site has to offer. Pictured here is Braden Paynter from the Frederick Douglass National Historic Site in Southeast Washington. We were pleased to host ten other historic sites and museums from the area -- President Lincoln's Cottage, Tudor Place, the Newseum, White House Historical Association, U.S. Capitol Historical Society, the African American Civil War Memorial and Museum, and four National Park Service sites: Ford's Theater, the Civil War Defenses of Washington, Frederick Douglass National Historic Site, and the National Mall and Memorial Parks. Our organizations are collaborating on joint programming to commemorate the upcoming 150th anniversary of the Civil War. You might ask, what does a synagogue built 11 years after the Civil War ended have to do with that conflict? President Ulysses S. Grant attended its dedication, perhaps to atone for General Order No. 11, which he issued while commanding the Department of the Tennessee (western Kentucky, western Tennessee, northern Mississippi) in 1862. That order--quickly rescinded by President Lincoln--expelled Jews from the area under his control. This story is among the many told in our exhibition Jewish Life in Mr. Lincoln's City. You can see a traveling version of that exhibition at the Jewish Community Center of Northern Virginia through February 22! And don't miss one of our upcoming talks about Jewish life in Civil War Washington.